Fixposition is an ETH spin-off specialising in real-time navigation systems for use in self-driving vehicles, robots or industrial drones. Using a combination of satellite-based positioning systems such as GPS with computer vision technologies, the young entrepreneurs have managed to achieve an unparalleled degree of precision. Visits to Shanghai, Beijing, Shenzhen, Hong Kong and to the recent World Economic Forum conference in Tianjin: Lukas Meier and Zhenzhong Su completed a strenuous two-week tour of China in September. The ETH spin-off was chosen as one of ten companies making up the Swiss national start-up team and took part in the trip to China organised by Venturelab, a funding body that supports young entrepreneurs. “It was helpful for making initial contacts with investors,” Meier explains. But it was his co-founder Su who had to work the hardest. “It was often the case that we spent half an hour chatting with potential investors in English, but then Su would switch to Chinese and suddenly everyone became clear about everything.” They both had to laugh as Meier tells the story from his point of view. Su had an advantage that could be crucial for breaking into China’s market: he is Chinese. 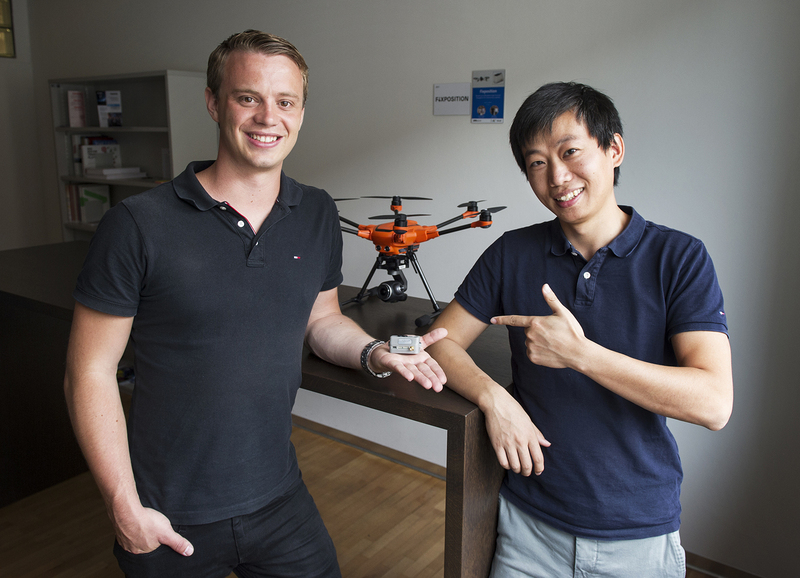 Founded in August 2017, the start-up Fixposition produces high-precision navigation systems that can be fitted into autonomous devices such as drones, robots or driverless vehicles. Meier shows the tiny component, not much bigger than a matchbox, and explains: “This technology enables us to pinpoint the position of a device fitted with our system with centimetre accuracy”. 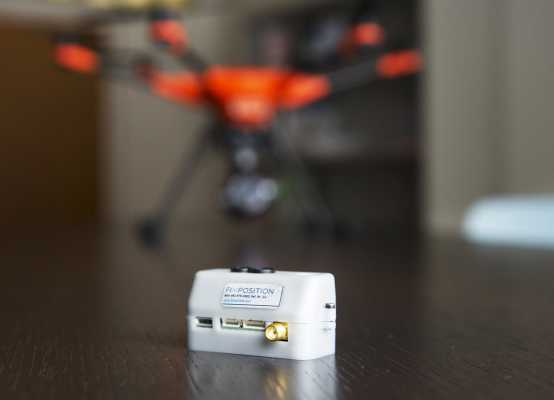 The revolutionary aspect is that localisation is even possible in obstructed environments with a weak GPS signal, such as among high-rise buildings in cities, in forests or even underground. To make the system work, Su and Meier combine the advantages of cutting-edge satellite navigation with advanced computer vision technology. Or to put it another way: even with limited signal reception, the car, drone or robot can still operate by visually scanning the environment and checking it for recognisable details. “That’s exactly how our eyes work as well,” Su says. To survive as a start-up, the company founders have decided to concentrate on drones for the time being. “Drones are no longer marketed purely as toys, but are increasingly being used for industrial applications,” Su says. He estimates the value of the global market for commercially used drones that Fixposition wants to break into at around three billion Swiss francs. Drones are currently being used in industry for tasks such as autonomous inspection or monitoring of installations, delivering goods or spraying pesticides on crops. In China, drones are also being used in a way that is still fairly unheard of in the west: light shows in place of traditional fireworks. “Every city in China has this sort of light show,” Su says and plays a video on his mobile phone showing a swarm of drones creating a magical spectacle in the night sky with intricate colour patterns above a Chinese city. China is not only a crucial market for Fixposition because so many companies are located there that need drones with high-precision navigation systems: the world’s biggest drone manufacturers are based there as well. Fixposition has already signed a partnership agreement with one of them. Thanks to its Chinese activities and the acquisition of various other customers, Fixposition has already managed to generate revenues in its first year of trading. But the company has yet to break even and therefore still needs the support of external investors. The start-up has received initial funding from ETH Zurich’s Pioneer Fellowship and from the ESA-BIC Incubation Program sponsored by the European Space Agency. The young entrepreneurs are currently in the process of concluding their first deals for a million of funding from local investors. “It’s looking very good,” says Meier happily. The founders want to use this injection of capital to expand their workforce from 5 to a dozen. They not only need to recruit software engineers, but also people working in marketing, sales, business development and acquisition. On top of that, they plan to open an office in China in the next few months. It was actually a stroke of luck that Su and Meier linked up: they were originally following quite separate paths. While Su was studying at ETH for his doctorate on satellite navigation under Professors Alain Geiger and Markus Rothacher, Meier was writing a thesis on visual navigation for drones as part of his Master’s course at ETH. Just like the other team members Tonio Gsell and Lorenz Meier, they dreamed of founding their own start-up and received a Pioneer Fellowship from ETH to pursue their dream. During this time, they got to know each other and realised that they shared a common goal: creating a high-precision and reliable navigation system for professional users. Looking back, Meier and Su say that apart from the incredible support from their mentors, one of the biggest benefits of the Pioneer Fellowship was that their paths crossed. "Lino Guzzella leaves behind an ETH flagship that is right on course."